Home > Letters > Patrick Pruaitch & Peter O'Neil are inseparable. Patrick Pruaitch & Peter O'Neil are inseparable. Deputy Opposition Leader and Pangu Pati leader, Hon Sam Basil, MP says he is drawing a line in the sand. Mr Basil says, I refuse to align with any individual or party leader who has a record of colluding with the PNC government led by Prime Minister Peter O’Neill. The Pangu Pati leader wants to make his bold stand clear. Mr Basil says ‘if I am to secure the numbers I need to form a new PNG government, I will not work with any team responsible for the recent economic destruction of this country. I refuse to acknowledge any party policies or recent public announcements denouncing the coalition government led by the People’s National Congress (PNC) & National Alliance (NA). The inconvenient truth should not provide a platform now for disgraced coalition partners to air their grievances. “I am very angry to read and hear announcements by the National Alliance Party leader that he is disgusted or detached from the mess he helped to create, by virtue of the fact that he stood behind Peter O’Neill providing the numbers and the political will to defame and destroy our massive economy.” Mr Basil said. The latest budget figures and the analysis done on the 2017 budget expose a catastrophic disaster that any new government will have to clean up. “A new government will inherit a future of billions of kina worth of debt burdens and broken institutions.” A future Prime Minister will need to focus entirely on repair, reconstruction and rehabilitation. Unfortunately this scenario means that service delivery, diplomatic ties and PNG’s development priorities will be determined by the legacy of the O’Neill regimes incompetence.” I will not stand for this. If I am that person, to lead this country in the coming months, I do not want my coalition government to be susceptible to the lies, deceit and consequences of the PNC/NA led coalition government. National Alliance led by Patrick Pruaitch, has lost all the credibility defined by the founding leader Grand Chief Sir Michael Somare. In 4 years Treasurer Pruaitch has assisted O’Neill to reverse the credibility of Papua New Guinea as a mature and governable resource nation. Patrick Pruaitch must be held to account at the polls. He must not stand back now and hurl criticism at his co-conspirators PNC. Pruaitch must face the electorate now and admit to the disgrace that is our current economic record. Patrick Pruaitch must tell PNG the truth. He did not vote according to his conscience during the Vote of No Confidence in July 2016 when the PNG Constitution provided a window for a change of leadership. Pruaitch refused to acknowledge the fabrication and doctoring of budget figures as a shambles. 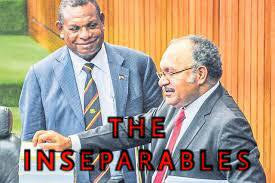 Instead he lied to parliament, he lied to his supporters and he lied to the people of PNG by giving the impression that the PNC/NA led government was in full control of the direction of this country. Mr Basil said. The sitting Wau/Bulolo MP expressed with urgency that “Papua New Guineans must go to the polls with one thing in mind.